A spring in the upper Colorado River arm of Lake Powell. This spring has emissions of methane and hydrogen sulfide. Also note the white precipitates of unknown chemicals on exposed reservoir sediment. Groundwater Contamination at Wyoming Power Plants. Water and Wastes Management. Nevada Must Take Environmental Protection Into Its Own Hands Now. Editorial Board Las Vegas Sun. How Drought and Other Extremes Impact Water Pollution, Berkeley Lab. 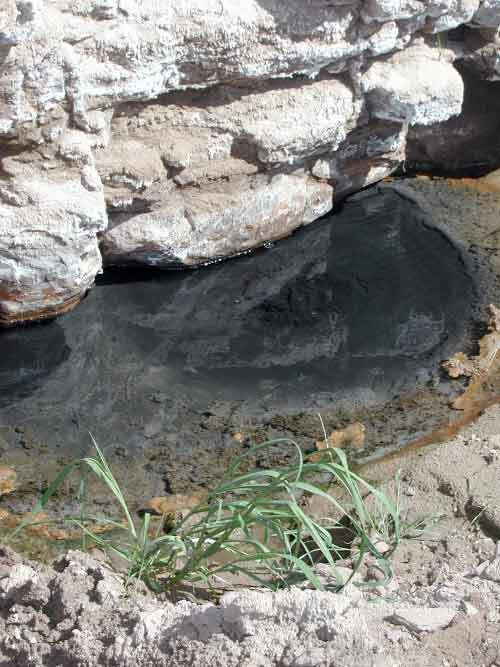 Study Will Look at Mining Pollution at Lake Powell. Desert News. Utah and Feds Study Lake Powell Pollution After Gold King Mine Spill. Associated Press. 1974 - DEIS for Las Vegas Wash/Bay Pollution Abatement Project. EPA. San Juan Watershed Monitoring Program. EPA. San JuanWatershed Project. Utah DWQ. Lake Powell Coring Project. Utah DWQ. 2014 - Water Quality Monitoring for Escalante River and Coyote Gulch in GCNRA. Dryer. 1971 - Pollution Affecting Las Vegas Wash, Lake Mead and the Lower Colorado River. EPA. 1980 - Nutrient Interactions Reservoirs Colorado River. Paulson. 1981 - Chemical and Biological Structure of Lake Mead Sediments. Prentki. 1983 - Influence of Lake Powell Suspended Sediment-Phosphorus Dynamics, Colorado River Inflow Lake Mead. Evans. 2007 - Water Quality Constituents. USBR DEIS Interim Guidelines. 2015 - Mercury and Selenium Accumulation in Colorado River Food Web, Grand Canyon. Walters et al. 2018 - Comprehensive Review of Fill Lake Mead First Initiative. Carey. Bibliography of Water Quality in the Upper Colorado River Basin. USGS. 1965 - Water Resources of the Upper Colorado River; (archived). USGS. 1974 - Geochemistry of Lake Powell. Reynolds. 1975 - Mercury in the Lake Powell Ecosystem. 1975 - Bacterial Contaiminations of Lake Powell Water: An Assessment of the Problem. Kidd. 1976 - The Effect of Lake Powell on Dissolved Silica Cycling in the Colorado River. 1978 - Analysis of Metallic Cations in the Lake Powell Ecosystem and Tributaries. Kidd. 1992 -Lake Powell Water Quality Report. Tinkler. 1996 - Physical and Chemical Characteristics of Lake Powell at the Forebay and Outflows of Glen Canyon Dam, Northeastern Arizona, 1990-91. Hart. 2015- Historical Physical and Chemical Data of Water at Lake Powell and Glen Canyon Dam Releases, 1964 to 2013. Vernieu. 2017 - Review of Salinity Control Program. Forum. 2018 -Temperature data for proposed temperature control device at Glen Canyon Dam. Adaptive Management Program. 2018 - San Juan Watershed Program; a Lake Powell sediment coring analysis. UDWQ. Quality of Water Colorado River Basin. USGS.